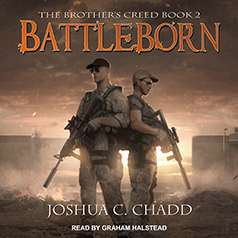 Joshua C. Chadd presents the second book in the Brother's Creed series. After the events in Nebraska, the Andderson brothers continue their trek northward, joined by Emmett and the girls. The group makes their way through Wyoming to meet up with Tank, the brothers' best friend from a time before the apocalypse. They're delayed when they stumble upon a school full of over a hundred survivors—most of them children. While Connor disagrees with James's choice to help them, he follows his brother's lead as a series of drastic events makes James the unspoken leader of the large group. Responsibility weighing heavily on James's shoulders, they resume their journey north to rendezvous with Tank. Zombies become the least of their concerns as the group faces a new enemy hell-bent on their destruction. When the situation goes from bad to worse, the brothers are confronted with the horrible reality that no matter how prepared you are, at the end of the world, death is always right around the corner.